I'm usually pretty cautious when it comes to publicly stating that a software or service is the best there is. Martview on the other hand has a lot going for it, and for me, it is currently the best pdf ebook reader for Windows. Having said that, it may not be the best for you, depending on your requirements and needs. I like several aspects of the program, from its online library that offers free downloads of ebooks and magazines over the paper like navigation of pages to the comfortable handling with the mouse and hotkeys. Lets start at the beginning. Martview is a free ebook reader for the Windows operating system. It supports both the pdf document format and its own mart format. Format support is one of the aspects of the application that the developers need to improve, to add support for widely used ebook formats like epub, comic book archive files or even plain text documents and Microsoft Word documents. For now, you can only load mart and pdf documents. There is an option to create ebooks in the mart format from images, archives or comic book files but that's not a suitable solution. It may work for single files but if you have hundreds of ebooks in different formats then you surely do not want to convert all of them into a different format just to be able to read them in the ebook reader. Martview is on the other hand excellent if your ebook collection is available in pdf format, or if you want to download and read the available online magazines and ebooks that have been uploaded by other Martview users. Lets take a closer look at the controls and handling first, before we take a look at the online library and other features. A help document explaining the handling and navigational elements of the ebook reader is displayed when you start the program for the first time. You can flip the pages with a click of the mouse on the left or right page and a flick of the mouse in the opposite direction, just as you would do with a normal book or magazine. You can alternatively use the cursor keys for navigation, the mouse wheel or switch the controls to touch mode if you have touch capable hardware. You can zoom in and out if you press the left and right mouse button at the same time, or if you hold down the right mouse button and use the scroll wheel. 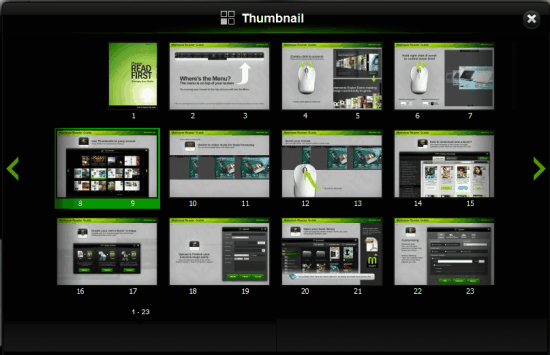 The hotkey Ctrt-l displays all pages of the ebook as thumbnails for easy navigation, while the horizontal or vertical slide mode offers to move faster through a document by sliding it horizontally or vertically. The reading options are versatile and helpful. The different browsing modes and the mouse and keyboard shortcuts make the experience as comfortable as possible. 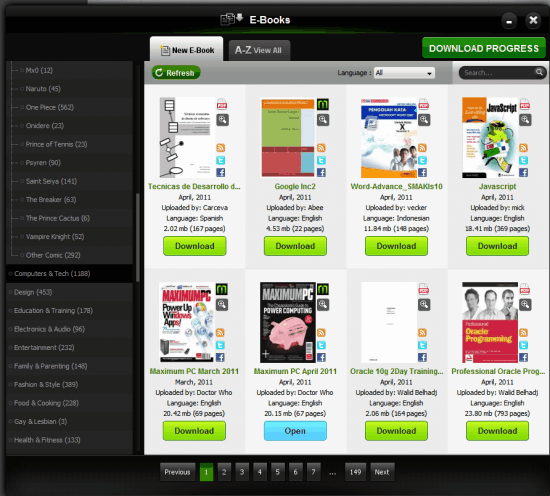 The online library of ebooks and magazines alone justifies the installation of the reader. A total of 13000 different documents are available, all uploaded by users of the service. Ebooks and magazines are sorted in categories like computers and tech, lifestyle, repairing manuals or comics and manga. Some offer subcategories. The comics and mange section for instance has more than a dozen subcategories for popular series such as Detective Conan, Bleach, Hunter X Hunter or Full Metal Alchemist. All magazines and books that are displayed in the library can be downloaded to the local computer system. Martview's policy is that users need to be the owner of the document to upload it to the public library. Several of the magazines raise legality questions, but that is something that this review cannot sufficiently address. All online documents are provided in mart format with no option to convert the files once they have been downloaded, at least not from within the ebook reading software. Martview's online library is a feature that not many ebook readers offer at this moment. It adds lots of value to the program. That, and the excellent controls make it one of the best ebook readers on Windows. The developers need to add support for additional formats including conversions between formats to make it the best ebook reader there is. Interested Windows users can download the latest version of Martview from the developer website. This looks great and just what I need. of that I take this one to the bank. I really like the interface and the online library. They should add support for additional file types though. It is just Windows I think. as a recommended safety measure. if you can turn OFF JS in their reader. 1. There’s NO one to contact at the online company! 2. NO way to update your listing or remove duplicated uploads! 3. NO customer support whatsoever! Before that, when the company was known as SpotBit.com, you could have all that plus more: you could even sell your eBooks and eZines. Now it looks like a great abandoned project ;-( If that’s what you want, just upload any PDF and their freeware will do the rest. Bob, thanks for the additional information, did not know that it was formerly know as SpotBit. while it looks really polished, the reader crops my (scanned comic)-pdf in a weird way so that ca. 10% on the left side isn’t readable. there seems to be no way to change this display behaviour in the options (other pdf readers do show the full page), and as mentioned above there is no support/forum. otherwise a good find, but I won’t be using this with these display issues. How do you “close” the eBook you currently have open? 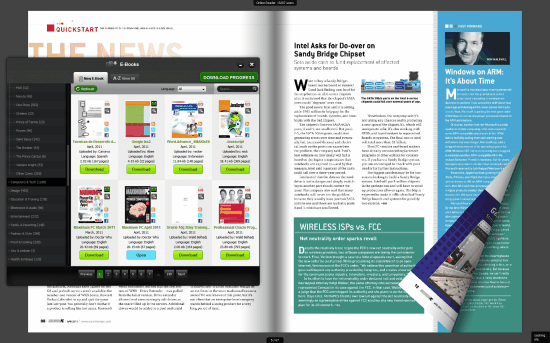 Also how about the pages of ads inserted in every ebook….even from my own PDF files I’ve created. Is this just part having something free! I’m very surprised to execute this program and see all function inserted ,i think is one of the best Ebook i’ve never seen today. I would like to know if anyone can help me if is there any site how can explain me develop this program because i’ve my PC that execute correctly this program but i can see correct format layout page inside it. to set this program in dual display mode. I have the same question: How do a CLOSE the book I have on screen??? ?